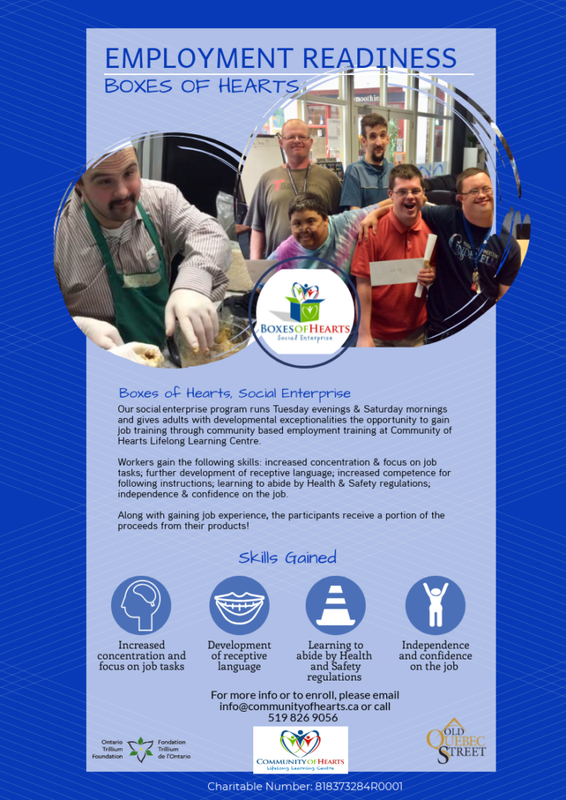 Our social enterprise program runs Tuesday evenings & Saturday mornings and gives adults with developmental exceptionalities the opportunity to gain job training through community based employment training at Community of Hearts Lifelong Learning Centre. Workers gain the following skills: increased concentration & focus on job tasks; further development of receptive language; increased competence for following instructions; learning to abide by Health & Safety regulations; independence & confidence on the job. Along with gaining job experience, the participants receive a portion of the proceeds from their products! Contact us at [email protected] or 519 826 9056 to sign up!